C & K Atelier - Fetish-Couture in highest Quality - Handmade in Germany - - Trenchcoat "Nashville"
This knee-length coat is a real master piece in our collection. Catch this dream of coat ! The cut is form-fitting, but not skintight, so you can wear easy a wool pullover under it. Lots of exclusive designs makes it to a real showpiece. 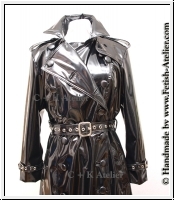 The coat is worked double-breasted, the buttons are handmade in vinyl or imitation leather. The buttonholes are worked as edging buttonholes. The collar you can wear up or flat down, like your convenience. At the front and the back side with storm patches for the typical trenchcoat design. At the sleeves with adjustable buckles, with the waistbelt you fit the coat to your body. The trenchcoat is sewed with a lot of decoration seams, makes a very unique and exclusive design. The flap pockets at the side are sewed also with a lot of decoration seams and with extra big pocket. 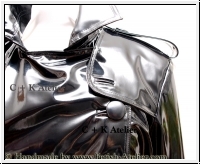 The extra wide epaulette are also decorated with a handmade button in vinyl or imitation leather. This unique trenchcoat is the ideal companion for your next rain walk. Like all our coats this is also with a satin innerlining. Would you like another features, for example a another collar, coloured buttons or the coat longer or for example another looking design? Please send us your wishes, ideas and suggestions, we make it real. This Product was added to our catalogue on Saturday, 20. April 2013.